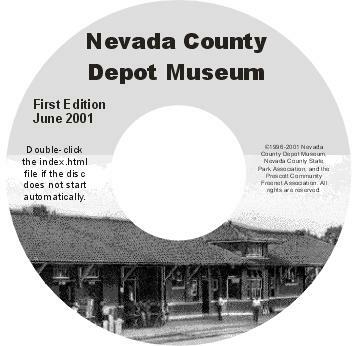 The first edition of the Nevada County Depot Museum's "History of Nevada County" project is on CDROM. The CD includes articles, cemetery surveys, and digitized photographs. The release is in association with the Prescott Community Freenet Association, whose PCFA.ORG Internet server is the source of the material. All content can be viewed through a web browser. Articles include information about the Prairie De Ann Battlefield, the iron bridge, the City of Prescott at 62 years old, past industries, the Oak Grove School District, the McRae Schools, and "Old Mike". There are also articles on several of the county's historic churches, quick facts organized by year from 1871 to 1932, and listings of early city and county officials. The cemetery surveys were conducted by the Extension Homemakers Clubs in the 1950s and indexed by CETA workers in the 1970s. There are 12,760 listings, arranged alphabetically in 92 cemeteries indexes and 26 surname indexes. The electronic version of the Depot's first four photo albums contains 649 pictures with captions. The photos, which represent a great start of a pictorial history of Nevada Country, have been copied from family pictures taken to the Depot Museum. The CD allows photos to be accessed by book number or decade. Once a picture is chosen, it's possible to browse through the pictures and captions. The Depot's photo books were created by and are maintained by John Teeter. James Cross entered the captions and scanned the photos. Articles were entered by Martha Smith, Jo DeWoody, Donna Wingfield, John Miller, and Jon Chadwell. Betsy Mills entered the cemetery records into a computer database and provided an update to the records. The Depot's electronic and Internet web projects are managed by Danny Stewart. 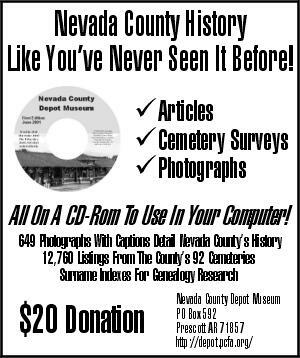 CDs are sent to persons who contribute $20.00 to the Nevada County Depot Museum and request the CD. CDs produced by Danny Stewart Consulting. Duplication by Diversified Systems Group, Inc.